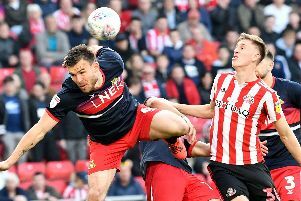 Grant McCann insists Doncaster Rovers can not only win promotion from League One this season but can claim the title as well. The Rovers boss says he has so far not seen any team his side should be fearful of as they hopefully embark on a push for a top six finish. Addressing the gathered audience at this week’s Meet The Owners event, McCann said: “We can win this league this season. I firmly believe that we can win the league. “There is nothing that stands out and makes you think that they’re going to be difficult to play against. “Last weekend we played the so-called best team so far in Peterborough and Portsmouth the week before and we should have come out with six points from those games. “There’s a long way to go, we all know that. “We just need to keep our focus on us and we’ll be okay. “The plan is for us to have a real good go at promotion. That is the belief. “We need to believe in ourselves as a group and come together as a whole club, win, lose or draw. Defeat for Rovers to Newcastle United U21s on Tuesday night in the Checkatrade Trophy made it six consecutive matches without victory. McCann is not too disheartened by the statistic and says impressive performances show his side are on the right track. “I think it’s been an okay start for us,” he said. “The players are getting to know me and know I will never settle for mediocrity. Rovers welcome Luton Town to the Keepmoat on Saturday looking for their first League One win since beating Wycombe Wanderers on August 11. Joe Wright is set to be back available after sitting out the draw at Peterborough with an ankle injury while Danny Andrew has shrugged off a foot problem he suffered in the game. But the main concern for Rovers is skipper Tommy Rowe, who suffered a hamstring injury during Tuesday night’s loss to Newcastle.